It’s tough to be the equally talented, more heart-healthy sibling of a famous celebrity; if you’re going to have to share their last name, shouldn’t you be able to share their spotlight, too? 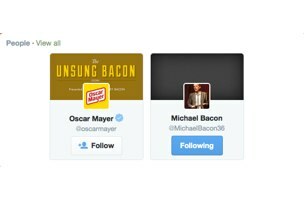 Now, the other Bacons (Kevin’s brother Michael and Oscar Mayer‘s turkey bacon) are teaming up to help make this underdog fantasy a Twitter-fueled reality. Sure, Michael Bacon might be 50% of the band The Bacon Brothers, but Kevin is likely almost 100% of the reason people want to hear them play. And while turkey bacon is undeniably delicious, T-shirts, recipes, and burger joints all celebrate its porkier counterpart. This campaign aims to change all that. The campaign urges people to celebrate the story of the #UnsungBacon by following Michael on Twitter, with the eventual goal of overtaking his movie-star-brother’s number of followers — a lofty goal to be sure, as Michael currently has 1,680 followers while Kevin boasts over 431,000. But Oscar Mayer, brand king of all processed meats, really believes in Michael (and its own product), and is determined to show the world the wonders of both.